Pattern has the power to instantly transform every space it touches. 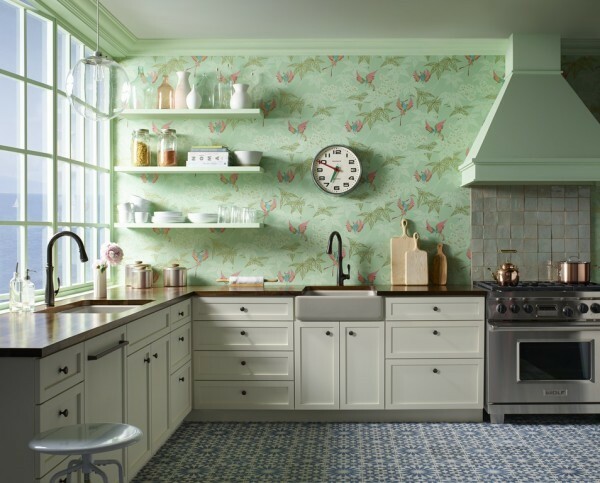 Whether you pair a wall of hummingbirds with graphic Moorish floor tile or go big with a bold chevron backsplash, the kitchen is the perfect place to show off a love of pattern in your own unique style. Of course, you'll want to choose hardworking products that make prep and cleanup easier and look fabulous doing it. An eclectic blend of textures, colors, and materials takes center stage in this warm, livable kitchen, where pattern is seriously at play. Clean white cabinetry and rich wood countertops keep the mood casual, while hummingbirds add whimsy to pastel-hued walls. A pair of work zones, one that lends the space a vintage farmhouse style, makes it easy for a couple or friends to collaborate on culinary adventures without stepping on each other's toes. Consider a bronze-finish faucet to add solidity to a whimsical pastel color scheme. Farmhouse-style elements, like an apron-front sink and copper teakettle, ground the look in classic style and help keep it traditional. Balance a riot of pattern with simple accessories like cutting boards and canisters. Love this trend? Explore our Soft Summer Kitchen moodboard. Graphics are emphatically on-trend in interior design. Strong lines, bold colors, and big patterns make modern spaces extraordinary. The kitchen is no exception, with brilliant solid-surface countertops and gleaming stainless steel holding their own against large-scale tile designs. And the space is as hardworking as it is stylish, with a pair of sinks and faucets that make prep and cleanup quick and easy. Stainless steel sinks and faucets in streamlined, modern style are the perfect neutral counterparts to a bold, geometric pattern. Warm wood cabinets soften a vivid pattern and prevent it from becoming overwhelming. 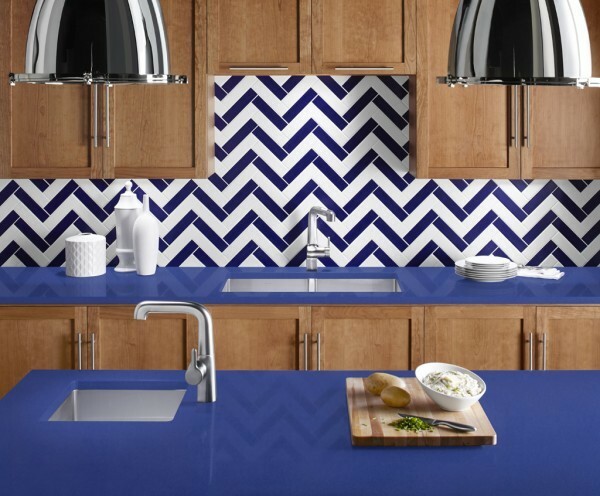 A two-color backsplash like this one offers versatility: You could choose white instead of cobalt countertops for a completely different look that works just as beautifully. Love this trend? 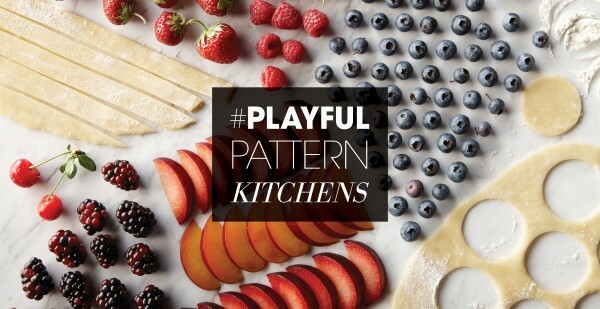 Explore our Geometric Mood Kitchen moodboard. Looking for the perfect culinary complement to this trend? 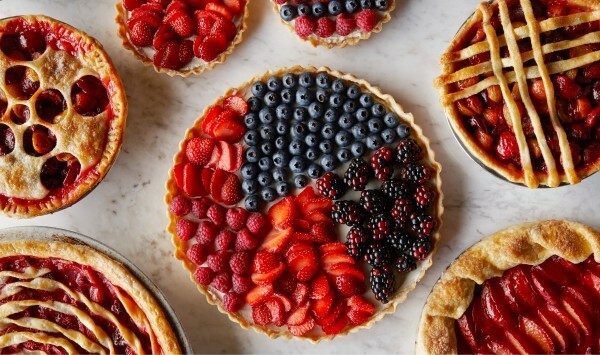 Get our delectable fruit tart, pie, and galette recipes.